News News articles Simply excellent! Just launched and already scooping the prizes: the HEUFT prime was among the winners straight away at its market launch in Australia. The full container check was one of the top three prizewinners of the Best New Product Award at the AUSPACK 2015 exhibition. 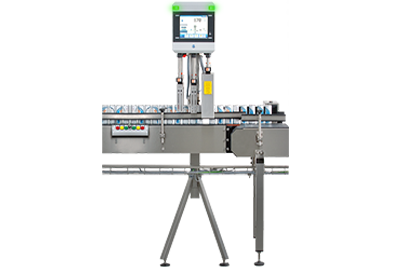 The high degree of automation and in particular the revolutionary audiovisual user guidance of the compact device impressed the competent jury of the Australian Packaging and Processing Machinery Association (APPMA). APPMA Chairman Mark Dingley characterised the solutions which were awarded the "Industry Excellence Awards" at the packaging exhibition in Melbourne at the end of March as "innovative and excellent". Nine reached the final in the "Best New Product" category but only three of them made it to the podium. Amongst them: the HEUFT prime! The system for checking the fill level, closure and labels achieved a "high commendation" just behind first place. HEUFT Sales Director Johann Garnier was delighted at the awards ceremony with the successful Australian debut of the device at AUSPACK 2015. The decisive factors for this award were not only the tried and tested modules and functions for precisely checking the quality of newly filled food, drink and pharmaceutical packaging in-line but also, in particular, the excellent resource efficiency of the HEUFT prime: the highly automated device performs its tasks completely independently for 99 per cent of its operating time. The personalised audiovisual HEUFT NaVi user guidance provides self-explanatory step-by-step assistance for brand changes, self-test programs or cleaning and maintenance tasks. In this way easy, tamper-proof and error-free operation of the compact full container check is possible even without any previous knowledge. Therefore on the basis of these advantages the HEUFT prime is now officially among the "most innovative equipment of the packaging and processing industry which was launched for the first time in Australia at AUSPACK 2015". Simply excellent!